Offer valid through February 10. Additional phone and internet fees apply. Not valid on previously purchased tickets. 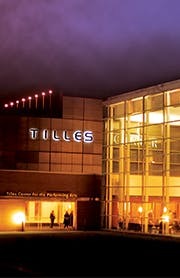 Tilles Center for the Performing Arts at LIU Post, in Brookville, is Long Island’s premier concert hall. For 38 years, Tilles Center has been host to more than 70 performances each season by world-renowned artists in music, theater and dance. Tilles Center was the first to bring the New York Philharmonic to Long Island and Bruce Springsteen’s legendary “Santa Claus is Comin’ to Town” was recorded onsite. The Tony Award-winning Best Musical, Monty Python’s Spamalot, is lovingly ripped off from the film classic Monty Python and the Holy Grail with a book by Eric Idle and music and lyrics by the Grammy Award-winning team of Mr. Idle and John Du Prez. Spamalot tells the tale of King Arthur and his Knights of the Round Table as they embark on their quest for the Holy Grail. Expect flying cows, killer rabbits, taunting Frenchmen and show-stopping musical numbers! Something Rotten! is “Broadway’s big, fat hit!” (New York Post). Set in 1595, this hilarious smash tells the story of Nick and Nigel Bottom, two brothers who are desperate to write a hit play. When a local soothsayer foretells that the future of theatre involves singing, dancing and acting at the same time, Nick and Nigel set out to write the world’s very first musical! With its heart on its ruffled sleeve and sequins in its soul, Something Rotten! is “The Producers + The Book of Mormon. Squared!” (New York Magazine). “Sparkling, fresh and lively.” – Los Angeles Times. The Hills Are Alive! A brand new production of The Sound of Music is coming to Tilles Center. The beloved musical story of Maria and the von Trapp Family will once again thrill audiences with its Tony®, Grammy® and Academy Award®-winning Best Score, including My Favorite Things, Edelweiss and the title song. The Sound of Music enjoyed extraordinary success as a live television production when The Sound of Music Live! aired on NBC in December 2013 and was seen by over 44 million people. 2015 marked the 50th anniversary of the film version, which continues to be the most successful movie musical in history. The winner of Broadway.com’s Audience Choice Award for Best Musical, this breathtaking smash “captures the kid-at-heart,” says TIME Magazine. Vogue cheers, “It’s a must-see you’ll remember for years to come!” Directed by visionary Tony®-winner Diane Paulus and based on the critically-acclaimed Academy Award®-winning film, Finding Neverland tells the incredible story behind one of the world’s most beloved characters: Peter Pan. Playwright J.M. Barrie struggles to find inspiration until he meets four young brothers and their beautiful widowed mother. Spellbound by the boys’ enchanting make-believe adventures, he sets out to write a play that will astound London theatergoers. With a little bit of pixie dust and a lot of faith, Barrie takes this monumental leap, leaving his old world behind for Neverland, where nothing is impossible and the wonder of childhood lasts forever. The magic of Barrie’s classic tale springs spectacularly to life in this heartwarming theatrical event. Finding Neverland is “far and away the best musical of the year!” (NPR).